A Ukulele Meetup each month at The Ukulele Place at The Rhythm Inlet. Everyone’s welcome, all levels of players, beginners to professional, & friends to listen & groove! Come strum, sing, toe tap, percuss, or simply relax & enjoy the music & merriment of some friendly folks. Several of us go out for food & drink in the ‘hood afterwards. You’re invited! 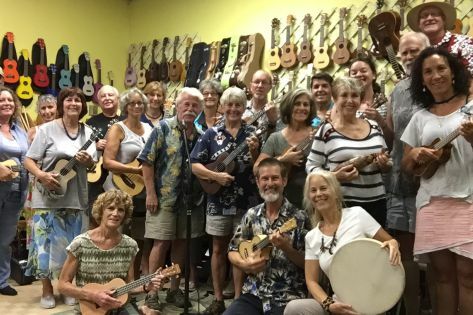 Note: The Suncoast Sand Fleas is a ukulele Meetup group that organizes & enjoys many other uke-related activities in the area, as well. And they have a presence on 2 websites: Meetup & Facebook. Stay updated on events & communicate with members by joining those pages.